Dave Campbell’s Texas Football has partnered with the North Texas Honda Dealers to honor community helpers from across North Texas. Texas is fortunate to have so many great individuals that give back to their community in so many different ways. Thanks to the support of the North Texas Honda Dealers, we have the opportunity to shine the light on a few very deserving individuals! When asked recently to explain all that Brandy Haynes does for his program, Burleson High School head coach Gary McElroy admits that no matter how many things he lists that he’ll never be able to list everything. Brandy simply does a little (or a lot) of everything for the Burleson program. An eight-year veteran of the booster club, Brandy coordinate fundraisers, golf tournaments, senior pictures and a host of other key tasks that keep the motor humming. In honor of her dedicated service, the North Texas Honda Dealers have honored Brandy with its Honda Helpers Award and given her the perfect helpful gift – a gas card – so she can visit both her boys in college. When your nickname is “Hollywood" you’d better bring the heat every single week. Anyone at Richland High School who’s spent more than 10 seconds with Lawrence “Hollywood” Lynch knows he’s got no problem living up to his colorful moniker. Whether he’s sharing wisdom with student-athletes or just giving them high-fives after big wins, Lynch has lent a helping hand to every Richland sports program for as long as anyone can remember. A former college and pro football player, Lynch has plenty of valuable knowledge to share. 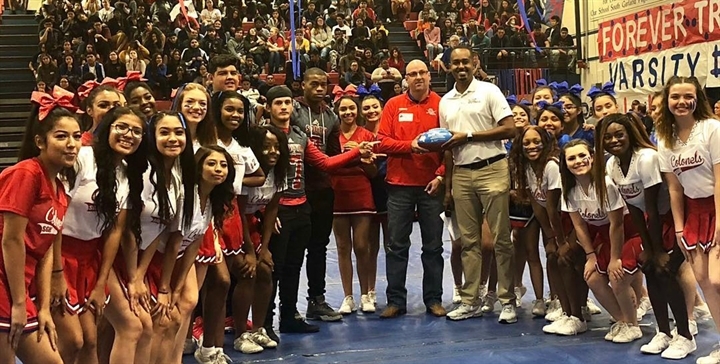 Dave Campbell’s Texas Football in partnership with the North Texas Honda Dealers wanted to do something helpful for Lynch so we hooked him up with two tickets to see his favorite team not named Richland – the Dallas Cowboys. You know you’re a big deal when folks around campus and the community are on a purely first-name basis with you. And that’s the case with Dodge, Hebron High School’s do-everything custodial superstar. Dodge was an easy choice as our Community Helper Award winner and the North Texas Honda Dealers gifted Dodge a pair of tickets to a Dallas Cowboys game. 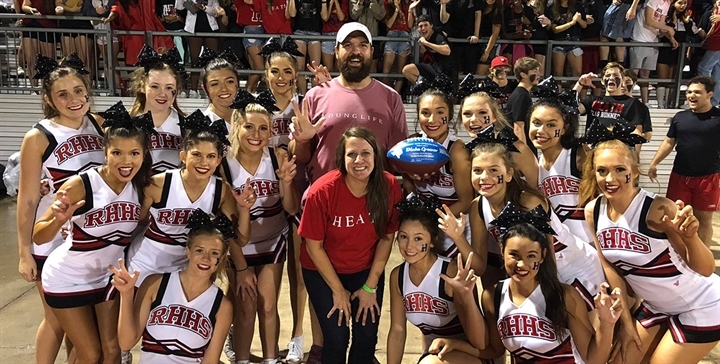 Hebron head football coach Brian Brazil didn’t skip a beat when we first talked to him about selecting Dodge as our Week 2 recipient. Brazil along with every coach at Hebron have come to rely on Dodge as a big part of all their teams. There are two landmarks that Paris, Texas, is famous for. One is the faux Eiffel Tower that dons a cowboy hat. The other is a factory worker named Kurt Burks. Kurt is a consummate presence around the Paris High School athletic programs. From fund raising to coaching state 7 on 7 football teams to painting parking spots and directing the in-game music, this fella is more than deserving of a little help from the North Texas Honda Dealers, which scored Kurt two Dallas Mavericks tickets for he and his son. For the past eight years, Blake Greener has been getting ready to be a dad and didn’t even realize it. An active member in the Young Life program in Rockwall, Greener is the consummate role model for role models in his hometown. 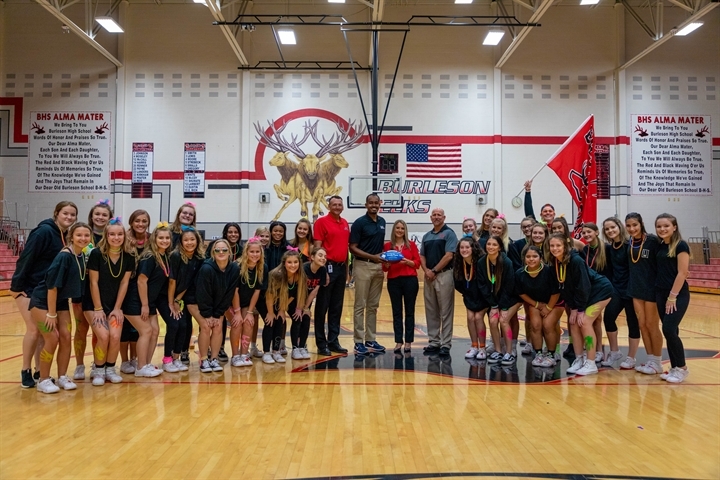 Thanks to his efforts to always being helpful for his community and his local high school, Rockwall Heath, Blake was our easy choice as a North Texas Honda Helper Award winner. Coincidentally, the man who’s mentored and inspired countless young people in the Rockwall Heath athletic program is about to become a father this winter. Exciting times for sure around the Greener household and the North Texas Honda Helpers wanted to help him by giving him a little shopping spree at Buy Buy Baby in Rockwall. Every time the South Garland High School football squad enters their locker room, it’s impossible not to remember Kevin Thomas. After all, Thomas helped furnish the locker room from his furniture store in Dallas and has always been there to support the program whenever they have been in need. That type of helping hand for the Colonels is the reason Kevin is one of our North Texas Honda Helper Award recipients. For the man who does a little bit of everything around the South Garland program, North Texas Honda Dealers decided to treat he and his wife and daughters to a fancy dinner on the town. Well-deserved indeed.